Pastime truck campers can be easily customized thanks to plethora of options available for customers…. Pastime Lightweight Campers are manufactured by Pastime Manufacturing based in Mt Angel, OR, since 1987. The company specializes in design and production of truck campers. They place more emphasis on craftsmanship and individual design of their models rather than on mass production. They have a wide range of models of various sizes and options in addition to standard equipment, offering the customers with plenty of choices. M-700FDS Camper has a length of 6 ft 6 inches. It comes with a cab over design with the dining in the front. M-750SD camper has overall length of 7 feet. It has a dinette on the side. M-640S Camper model is a cab over model with 7 ft 4 in. Overall length and side dinette. It comes with a self contained slide. M-800FDS model is 8 ft in length and has a front dinette. M-840LT model has an overall length of 8 ft 6 in. It has a side dinette. 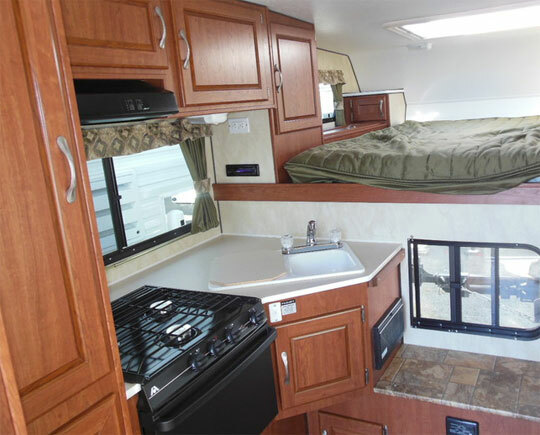 M-850SD Camper model is again 8 ft in length, but it comes with a side dinette. M-880SC model is a cab over design camper with a length of 8 ft 8 in. It has a side dinette. M-980SC model comes with a length of 9 ft 11 inches and a side dinette. It also has a self contained slide. Pastime pampers its buyers with a host of options for enhancing user experience. To get a feel of what is on offer let us discuss the options made available to the 700FDS camper buyers. Temperature control: There are three options for in selection of air conditioning and two in selection of heating. Kitchen: basic oven or a microwave oven or a microwave/ convection combo oven can be chosen. Also, a 3-way refrigerator and two types of water heater are on offer. Entertainment: 17 or 20 inches flat-screen LCD TV could be chosen. AM/FM/CD stereo and CD player (multiple) or DVD player could be picked up for audio entertainment. There is also on offer a satellite dish without receiver. Two types of gas generators, jacks - choice of hydraulic, electric or mechanical, aluminum wheels, patio and rear awning, dry-bath, fibreglass walls, high gloss external finish, outside shower, smoke detector, power roof vent, luggage ladder, rear cargo storage, rear view camera, solar battery charger and tents are noteworthy. There are Screen Rooms of 6 different lengths starting from 7 feet to 12 feet each on offer. 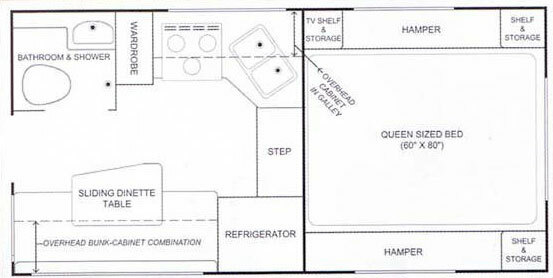 Other optional equipment includes electric flush toilet, water purifier and window awning….. The suggested retail price of M-700FDS model is $14,200. The low retail average price of the camper is $9,100. This price category indicates extensive wear and tear for the camper. The average retail base price of the model is $10,950. At this price the vehicle should be clean without glaring defects.